On his morning walks down West Maple Avenue, Harry Truman often stopped to admire and speak to a prominent Ginkgo tree shading the front yard of this property. He was overheard saying “you’re doing a good job,” as he patted the tree." 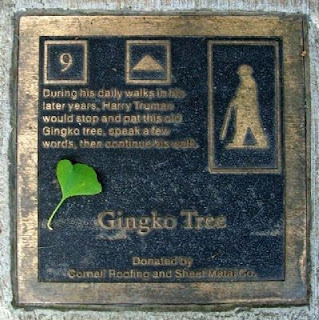 Harry Truman Ginkgo is designated as a famous & historic tree by American Forests. Truman Historic Walking Tour Stop 9: HMdb.org.